Greg has compiled a list of festivals he recommends, along with some comments about each one. Click here to download a PDF. Please look for the Turtlegrass banner to find a slow jam hosted by friendly Taborgrassers at the festivals listed here. $10 gets you ten million stars — and all the genuine old time, country and bluegrass music you can carry. It also gets you camping for the weekend. The festival is free to anyone not camping. Join a group of music lovers who have reserved Ekone Park in Goldendale, Washington - June 3 through June 5 - for an informal weekend-long picking party. You are welcome at the park anytime after 10 a.m. Friday, June 3, and you can stay until 10 a.m. on Monday. There will be some informal concerts and an open mic — and all the jamming you can imagine. Plus Goldendale is a lovely, welcoming community — featuring a fabulous observatory. Have questions? Email clairell@aracnet.com. See you there! Wheeler County Bluegrass Festival Fossil, OR. fondest memories of the summer. There is a parade on Friday, a car rally all weekend with an Elvis impersonator. The main stage is at the Courthouse lawn which is nicely shaded. The root beer floats at Big Timber are to die for as well as the steak dinners across the street at RJs. I recommend you throw an inflatable wading pool in the back of the car before you leave town for this one. Columbia Gorge Bluegrass Festival, Stevenson WA. fairgrounds is spectacular. Plus there is a sizable pond for canoeing or kayaking. Reservations for big RVs and camping need to be made well in advance. It’s windy folks. Stake all your stuff down, including the kids and dogs. My 10X10 canopy was half way to Idaho before I caught up to it a few years back. Winlock Picker’s Festival Winlock, WA. This small and very friendly festival is located in beautiful Winolequa Park. This is one of the best jamming festivals especially if you are new to the scene. The snack bar serves a basic breakfast and sells hot dogs and hamburgers. The train tracks just on the other side of the trees are long and straight and the trains are fast. The jingle, rumble and the roar provide a nice back up rhythm if you are singing or snoring in A flat. Mount St. Helens Bluegrass Festival Toledo, WA. I gotta say this is one of my favorite festivals. It’s located on the High School grounds, there is wide open lawn and beautiful oak groves to camp under. You have to get there early to find a spot under the oaks. There are band scrambles, a gospel show on Sunday, workshops and a snack shop. Showers too. You will probably get a friendly visit from the General, the man in charge, driving his golf cart through the festival grounds each day. Tygh Valley Jamboree Tygh Valley, OR. The finale festival of the season, this one is special for that reason and also because it is located in a beautiful valley in central Oregon surrounded by rocky buttes with clear skies at night and a billion stars. Settle in under the locust trees for some of the best jamming of the summer. Bring ear plugs if you want to get any sleep that weekend. Big RVs need to reserve a space well in advance. 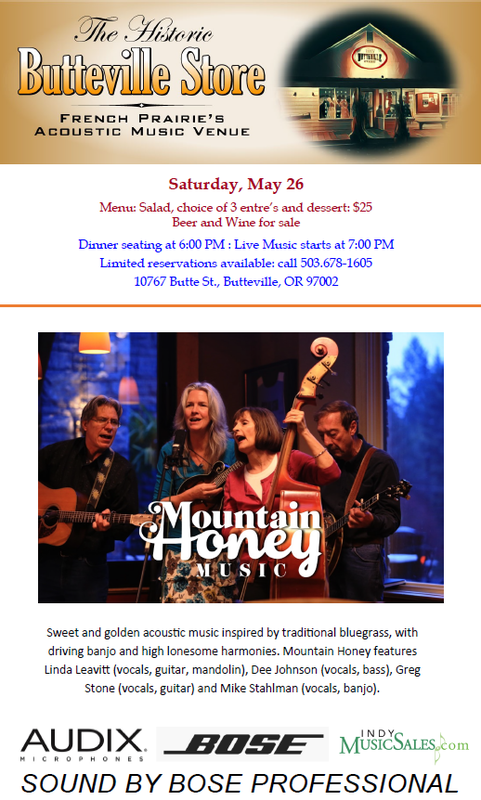 Mountain Honey at Butteville Store this Saturday! You don’t have to make a reservation or have the $25 for dinner to hear us play at 7pm, this Saturday night! Taborgrass's final day at St. David of Wales will be this Saturday at our annual Graduation Day Party. All alumni are encouraged to attend. We will talk about the past school year and also about the future festivals coming up this summer. We will also be saying goodbye to this wonderful church that has been our home for 7 years. The graduation program will start at 10am for both classes and the day will end at 1pm. There will be time for jamming I promise. Food and drink will be provided. Steeplegrass Reunion Festival, Sunday May 20th Noon to dark! A great way to break the ice and start the festival season for Taborgrassers! This is a very casual and friendly festival. There will be many of your pickin friends there. Annual Steeplegrass Reunion Picnic at Lewisville Park (Battleground, Washington). Rain or Shine- no kidding! We have a huge covered picnic area and a very big fireplace. Come pick, picnic, reminisce, and enjoy the company of other Steeplegrass alumni from those Vancouver, WA days of yore! Non-Steeple bluegrass picker’s also welcome! about, Donations accepted, $7.00 recommended.